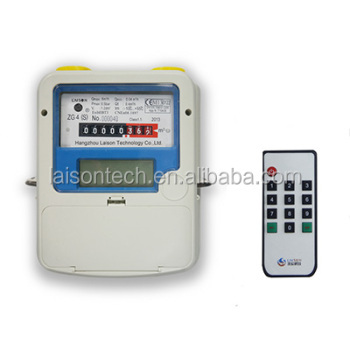 LAISON Infrared Split Type STS Prepayment Gas Meter System (Hereafter referred as IR STS Gas Meter) consists of smart gas meter and separate IR Token Pad. By applying the IR STS Gas Meter System, customers could recharge meter and inquire info. at home by inputting corresponding token in IR token pad conveniently. It is compatible with ZGS prepayment gas meter, which comply with OIMLR49, and conforms to STS standard protocol. G1’1/4 or G 3/4 etc. 4) Press “Enter Key” after inputting 20-digits token correctly. The LCD will display the operation result. If recharge successfully, LCD will display purchase amount, consumed amount etc. Successively. Insufficient gas Warning Function is optional in IR STS gas Meter. When remaining gas in meter reaches this value, buzzer will beep and LCD show UN01 to remind customers to recharge meter in time; Valve can be opened again by inputting inquiry token “12 + Enter Key” or 20-digits Clear Event Token provided by Authority Operator. Overdraft function is optional in IR STS gas Meter. When remaining gas in meter becomes 0, customers could open valve to enter into overdraft function by inputting inquiry token “12 + Enter Key” or 20-digits Clear Event Token provided by Authority Operator. Customers could open valve again if remaining gas in meter > 0 by inputting inquiry token “12 + Enter Key” or 20-digits Clear Event Token provided by Authority Operator. LAISON technology was established in 2012.It is a high integrated high tech enterprise with the research,production,sales and service as a whole. LAISON technology continues to improve Quality System Management.All the meters are manufactured in compliace with international standard,which ensure the legitimacy and quality of products staility. With the mission of "customer first,qualiy first,reputation first,service first''.LAISON technology attaches great importance to the technology innovation and the improvement of quality systemad provide warmhearted service to satify customers.